If you’ve ever been to a pig roast, you know it’s always a great feast with a golden brown pig taking center stage! Center stage in this case was a very large grill where the pig was perfectly roasted for hours until it was falling off the bone tender. The Accidental Locavore and Frank decided to celebrate a couple of birthdays ending in zeros, with the pig, a tent, and a large group of friends. As the invitation said, “the pig needs accompaniments, so please bring a dish…” and everyone stepped up to the plate. It helps that quite a few of our friends are great cooks, so we had no doubt that we’d all be eating well. The pig was left in the hands of Mark, of Hudson Valley Sausage. 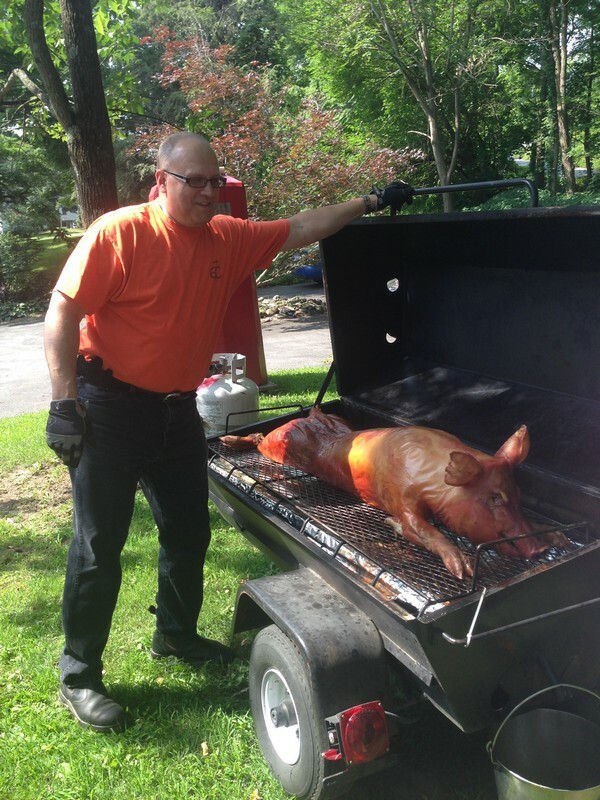 Our chef friends, threatened to boycott the pig roast if Mark wasn’t doing the pig, so that was a no-brainer. He arrived early Sunday morning, towing the roaster with a 100 pound pig. The dog happily followed him up the driveway, eagerly licking anything that dripped from the roaster. When Mark returned to finish the pig, he brought a big platter of some of his charcuterie. 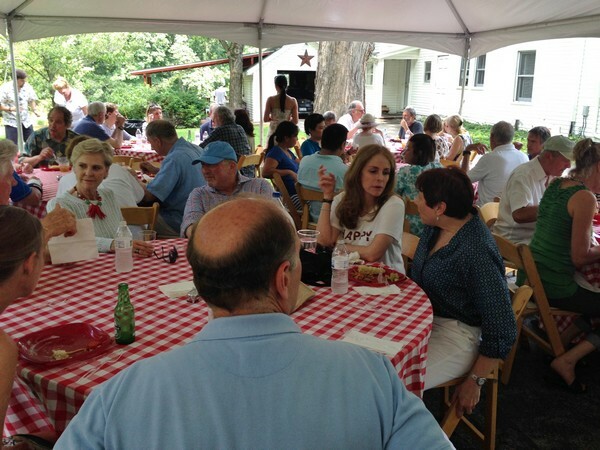 Early arrivals, sitting around chatting or waiting to play tennis, were treated to a wonderful variety of soppressata, pepperoni and salamis along with some provolone. All delicious with the pepperoni, being my personal favorite! Now, we’ve got to go over to Highland and check out his store. 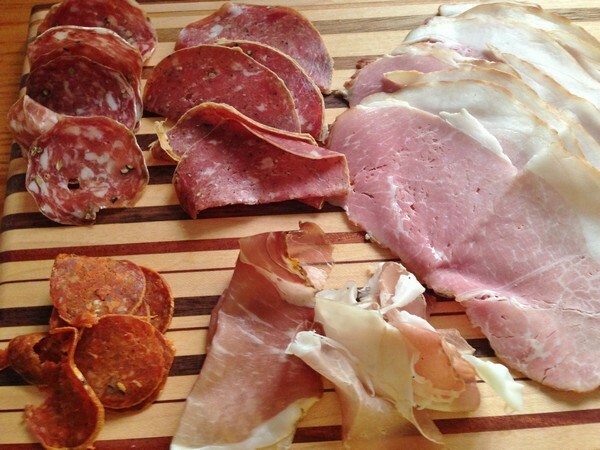 But wait there’s more…and more amazing charcuterie! John, one of our chef friends, who also teaches at the CIA, brought a platter with his selection of prosciutto, ham and salami (and a copy of his book on charcuterie, which I can’t wait to dive into). Now, I don’t want to start any cured meat wars among friends, but this was also some spectacular food! The salami, which I got to enjoy the following day, was one of the best I’ve ever eaten anywhere! There were lots of other great side dishes, including some wonderful Asian style baked beans, a bunch of terrific cole slaws, and what looked like a pasta salad with goat cheese but turned out to be thinly julienned squash. I’ve got to get the recipe for that and some of my other favorites! And not to leave out the star of the show—the pig was wonderful, tender and juicy, cooked to perfection. Several of us, jumped right in and grabbed chunks of the crunchy skin to munch on. 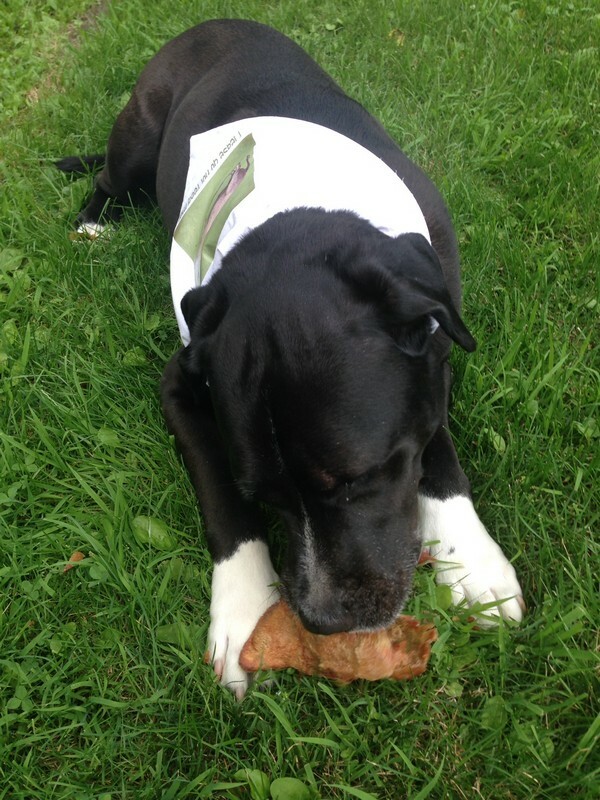 Even Rif was happy, munching on one of the ears (his favorite treat). If you still had room, there were lots of desserts! Great brownies, a citrus tart that everyone demolished (so I never got to taste it), along with cakes, tarts, cookies and watermelon cut into spears-easy to pick up and go! We had a wonderful caterer, As You Wish, who took care of everything, so Frank and I got to sit back and enjoy the party. It was such a good time, we’re already thinking about next year—maybe a lamb roast?